This past May, I followed Laurie Berkner, People Magazine’s queen of children’s music, on Twitter. Laurie sings and plays guitar in the Laurie Berkner Band. 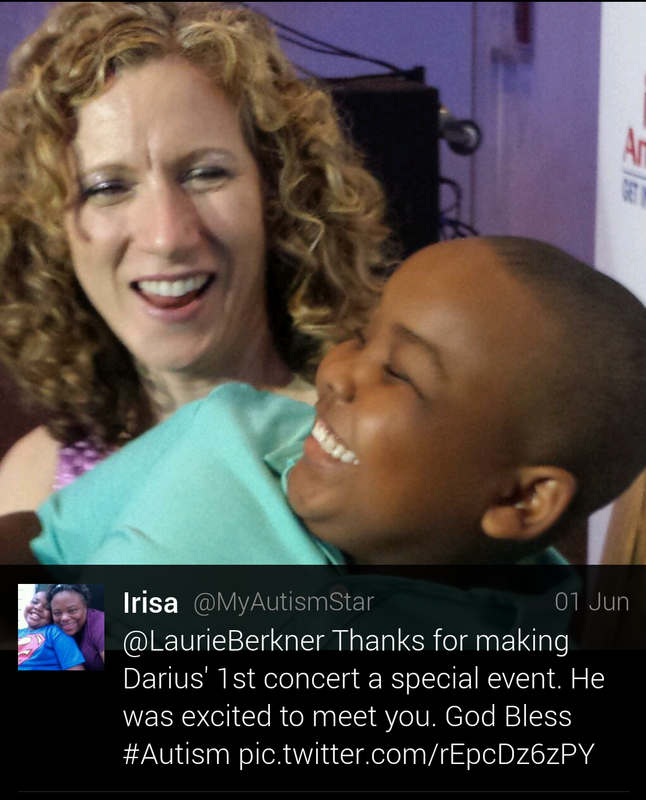 When Darius was 2 years old and receiving early intervention, his speech therapist would play videos from “We are…The Laurie Berkner Band” DVD. Even though he was nonverbal, he knew some of the words to the songs. His favorite tune was “We are the Dinosaurs.” Ever since then, Darius and I have been swimming with goldfish and dancing with pigs on our heads. Sometimes, I think I have more fun than Darius. Shortly after following Laurie, she tweeted that the band was performing at iPlayAmerica in Freehold, New Jersey on June 1st. After reading the tweet, I was excited. I could not believe she was playing near us. Suddenly, reality struck me like a bolt of lightning. What was I thinking? I can not take Darius to a music concert. I can not take him out of his daily routine and comfort zone. I want him to enjoy his childhood, but I am forced to cut out activities like sporting events, amusement parks and plays. Autism has a way of isolating you from the real world. The next day, I wrestled with whether or not I should take him to the concert. Kids buzzing like bumblebees and stomping like dinosaurs might send Darius on a sensory rollercoaster ride. Then again, keeping him trapped in his own world is not going to help him adjust to the real world. I discussed it with my husband and we decided that the three of us will attend the event. Immediately, I went online to buy the tickets. I did not want anything to change my mind. On the website, I was able to select the seats that I wanted. Therefore, I picked seats that were close to the exit. If Darius became overwhelmed and needed a break, we could quietly leave the auditorium without disturbing the other families. To my surprise, she sent me a direct message saying that she loves meeting her special needs fans. She offered me the opportunity to bring Darius backstage to meet her and the band. If I wanted to be on the list, I had to email Katie, her assistant. Of course, I wanted to bring the little guy backstage. I did not waste any time sending the email. A couple of days before the concert, I received an email notifying me that we were on the list for a meet and greet after the show. When we arrived at the concert, there were signs with Laurie Berkner’s name leading to auditorium. I asked Darius to read one of the signs. In his raspy voice (he sounds like Miles Davis) he said, “Laurie Berkner.” We walked inside a large room with chairs arranged like a theater. We quickly found our seats. The first thing that I noticed was the stage. It was decorated with clouds, moons, stars and a banner that read “The Laurie Berkner Band.” The instruments were already in place. While we waited for the show to start, music played at a low volume. As soon as Laurie came on stage, Darius eyes lit up and the biggest smile appeared on his face. He was so giddy that a little girl in front of us stared at him. A woman explained to her that he was very happy to see Laurie Berkner. Laurie and the band were excellent at interacting with their fans. We were entertained with some old favorites and a few new lullabies. Kids were singing, dancing and playing in the rows. Moms and dads bopped to the music while holding small children in their laps. It was definitely a family friendly atmosphere. After the show, Shannon, one of Laurie’s assistant, escorted us backstage. By then, the line was wrapped around the room. She took us to the front of the line. I was relieved. If we had to wait in the back of the line, Darius would have been kicking and screaming on the floor. When Laurie came out she said, “Hi Darius!” Darius was grinning from ear to ear. Laurie sat him on her lap for a photo. Next, she autographed a postcard for him. She hugged me, shook my husband’s hand and thanked us for our support. We should have been thanking her. Her kindness meant the world to us. For little over an hour, this concert brought some sunshine in our world. We finally had an opportunity to do something normal as a family. Darius was happy for the entire show. I think it helped that he did not have to stay in his seat and could move around freely. All and all, the concert was a memorable experience. In the future, I plan to experiment with taking him out more. I still have my worries; however, I know that the more steps we take outside our front door, the bigger his world will become.